Thank you SO much Suzy!!! They're almost too pretty to use! Some of these will be used as I progress through her fun Fabric Lace Book online class. More information can be found HERE about the class. 1. Quinn of 'Comptonia' has discovered a really fun way to find out more about the International Space Station and when it can be seen passing overhead. Go HERE to read about it. 2. C&T Publications has a fun free tutorial to make an 'Elegance Pleated Clutch' HERE. 3. There are instructions to make your own yarn swift HERE. 4. Kathy Shaw is taking registrations for her *free* beginners crazy quilt online class (Basic Crazy Quilting Course - BCQC) and you will have to hurry because registration for this class closes at midnight on Sept. 30. I've taken this class and it's wonderful. Go HERE. Today the quote is from Jimi Hendrix.... "When the power of love overcomes the love of power, the world will know peace"
Yesterday we were lucky enough to tag along on the first zoo trip with our grandson. We spent a few hours enjoying the small Elmvale Zoo, which is the perfect size for a little boy who is just discovering the world. It was perfect size for parents and grandparents too! We had a great day, and plans are made for a return trip next summer. Today the quote is from Sam Levenson.... "The simplest toy, one which even the youngest child can operate, is called a grandparent"
This is a fairly simple section - just a pumpkin button I found in my stash, with some silk ribbon and variegated pearl cotton lazy daisy stitches and some beads. We would love to see pictures of your spring-themed crazy quilting. We would love to read an article you might want to submit. Projects, tutorials, ads are all welcome for consideration for publication. Remember, the magazine is only as good as you help us make it! we all want to see it!! When I was doing my 'Looking Back' series a few weeks ago, I showed a picture of a fabric journal I did in an online class with Carole Brungar in 2010. A few people (well, a 'few' was actually two!!) expressed an interest in seeing more of it. So...a new series will begin. If you have seen all this before, hopefully you've forgotten enough to want to see it again. At the time I began working on this book, we were selling our home and moving into the apartment where we are now. We had a lovely big garden and I wanted something to remember it by. When we moved into the house the gardens were dismal. Nothing had been done with them in many years so they were overgrown and very few flowers were there. We had very little budget for plants, so asked our friends and family to think kindly of us when they were working in their gardens and any and all plants would be gratefully received. Needless to say, they came through in spades and we ended up with a ton of beautiful flower beds and a large veggie garden too. Before we moved I took a lot of pictures of the flowers and many of those photos appear in my journal. (as always, you should be able to click and embiggen the pictures if you so desire). This is the cover and a semi-side view of the book. I managed to be an over-achiever and made a book that was huge. This is the inside cover of my book. DH made the wooden sign that says 'Welcome to Our Friendship Garden'. He used some cast-off cedar fence rails. Morning Glory and a peony. I'm afraid I can't remember the exact name of the peony now. Today the quote is from Tony Robbins..... "Achieving goals by themselves will never make us happy in the long term: it's who you become, as you overcome the obstacles necessary to achieve your goals, that can give you the deepest sense and most long-lasting sense of fulfillment"
Yesterday DH and I had a semi-sanity day (and no comments from the peanut gallery regarding our mental state, please and thank you...lol). We sometimes just get in the car and head out for parts unknown just to escape from the house and all that goes along with it. We ended up driving through Algonquin Park (which, for those of you not from Ont. Canada, is probably the largest park in our province). It was too early for the leaves to have done much changing of colour but there were a few red trees here and there. We started the day having breakfast with our friends. All in all a nice day, but no stitching got done at Chez Magpie. The bulrushes are primarily silk ribbon with some floss straight stitches. The flower has a felt leaf and the petals were made using a woven stitch with pearl cotton; satin stitch and French knots. EDITED TO ADD: Linking up to the Super Mom- No Cape's Stitchery Linkie party HERE. Today your quote is from Marcel Proust.... "The real voyage of discovery consists not in seeking new landscapes but in having new eyes"
I thought, for a change of pace, I'd show you a couple of other things that have been happening here at Chez Magpie. This morning I finally got around to finishing up a couple of small journal covers I had knitted and now they're residing in the gift box. The yarn I used came from my stash and it's one that I guess could be called 'slubby' (for lack of a better word!). It's thick and thin throughout and is very soft. The colour is an off-white. I suspect it might take dye well, but I'm happy with the neutral tones so will leave well enough alone. A close-up of the crocheted flower I added. DH has been busily re-finishing a handmade truck that is over 30 years old with the plan to pass it along to our grandson. DH made this toy for our boys when they were small and it was well-loved at the time. Hopefully it will be loved once again. Today I'm linking up with the Simply Neutrals Tuesday linkie party over at Apple and Apricot HERE. Today the quote is from Jimmy Carter.... "God answers all our prayers. Sometimes the answer is yes. Sometimes the answer is no. Sometimes the answer is, you've got to be kidding! I have completed two more areas of my fall pillow cover. I'm still working on camouflaging the long seam and as you can see in the photo I've added another vine to the left (button flowers; silk ribbon leaves and back stitch). I also added a cute little cross stitch scarecrow. I've had a couple of people ask me about the origins of the 'thing' I have in my header, so I thought I'd show you the previous posts I did about it. IT is a needle roll that I made in 2014 and I must admit that it's one of my more favourite things that I've done over the years. You can see more about it HERE and HERE. There are a couple of things I've found of interest in my travels about the 'net, so thought I'd share them with you. First of all, there's a great post on Judy Cooper's blog pointing us to all sorts of great crazy quilting sites. You can go HERE to see that (and pour a cuppa before you go because you are going to spend some time there!!). And thank you Judy for including my blog of mumblings in that great list of resources!! CrazyQStitcher has an incredibly smart son who created something I am coveting for myself (and will try convincing my DH to make for me too!). My studio space is carpeted and dropping a needle or pin in here is like looking for the proverbial needle in a haystack. One of these creations found HERE is just what I need. There's a wonderful freebie over at Threadbare Creations - a Block of the Week Sampler quilt pattern. There are 46 different patterns available - all are free. Go HERE to see what that is about. EDITED TO ADD: Linking up with Super Mom No Cape's stitchy party HERE. Hope you have some fun with those links, and now here's your quote for the day (from Dale Carnegie).... "Let us not get so busy or live so fast that we can't listen to the music of the meadow or the symphony that glorifies the forest. Some things in the world are far more important than wealth; one of them is the ability to enjoy simple things"
The offending seam is the one that's beneath the owl and extends pretty much the entire height of the block. Not good. So.....the owl was stitched to break up that seam and then I added the curving vine with the purple flowers. Both of those things take the eye away from the seam itself. The eagle-eyed among you may have noted the demise of one of the bees (there were three). I felt the overall look of the vine was more important than the third bee. I also changed the orange flower on the right to have more of a 'presence' by adding the orange button in the center...another fool-the-eye into overlooking the long seam trick. Obviously this block is a number of small lessons in what not to do!! Today is another anonymous quote... "Calories - Tiny creatures that live in your closet and sew your clothes a little bit tighter every night"
Hah, and now I'd bet you might have that Andrea True Connection song running through your head (you know..."More, More, More, How Do You Like It"....). And there's nothing off-colour on this blog either (unless you count the photos I post that are out of focus!!). The little cross-stitched owl is being used because #1 - he's rather cute, and #2 because he helps to break up the long seam that is there. I also added the cross-stitched leaves on the seam beneath the pumpkin. Presents, of the Christmas sort, are being thought about at Chez Magpie. There's even been some purchasing of necessary fodder for said Christmas presents. Unfortunately some of the people who will be on the receiving end of my gifts read this blog and so I'll have to keep what I'm doing secret, at least for now. Today the quote is from Barbara Sheir..... "Down deep we really know our worth, but we don't have easy access to that knowledge. We need to hear praise coming from outside ourselves or we won't remember that we deserve it"
The apples were done using waste canvas and the wheat was embroidered over top of a tissue paper pattern. Today the quote is from Wayne Dyer.... "It is impossible for you to be angry and laugh at the same time. Anger and laughter are mutually exclusive and you have the power to choose either"
The horn of plenty (or cornucopia) was cross stitched using waste canvas. This design stretched the boundary of what is comfortably worked with this technique because it was a little too large and made removal of the canvas a trifle difficult. Patience was definitely a virtue with this motif! The little ear of corn is a combination of waste canvas cross stitch and beads. EDITED TO ADD: Today I'm linking up with Super Mom - No Cape's Stitchery Link Party HERE. Below you can see the wonderful little lady that crawled out of my mailbox yesterday! She is the creation of my friend Connie Eyberg and hasn't she done a marvelous job of miniaturizing macrame in order to make her? She will certainly be enjoying pride of place on my pillow cover!! Thank you SO much Connie! To read Connie's original post about her creation (and others besides) go HERE. Today, instead of a quote, I will give you a poem I found, by an unknown author. Enjoy. The area I was concerned with was the fence with flowers. The flowers were okay, but the fence was angled and it just didn't look 'right'. The dilemma was what to do to fix it - I could have unpicked all those stitches or possibly covered the whole section with a new piece of appliqued fabric and started again. I found this pretty little bird silkie in my stash and it fit absolutely perfectly over top of the offending area. The limb the bird is perched on isn't vertical the way I've used it, but looking at a real tree certainly shows that limbs aren't perfectly placed. The eye 'reads' the bird as being the focal point anyway and it appears to be sitting upright. Two rows of chain stitched in variagated green, whipped with orange works with the composition much better. Today your quote is from Evan Esar.... "Time: Nature's way of preventing everything from happening at once"
The fence and flowers are good - I like the pattern and it turned out well. It fit perfectly in the section of fabric I was trying to fill. BUT it's tilted the wrong way to suit the overall piece. Do you see what I mean in the first picture? The fence itself is lined up with the seam line below it, which normally would be fine. The pumpkin below it works okay (and it is lined up with the seam line). But (and here's the problem), the fence/flowers motif simply does not look right. It sticks out. It hurts the composition. It hurts my eyes to look at it. (and I don't want to hear you tell me that it's okay because I know it isn't). There are several options at this point. I could unpick all those little cross stitches (which would take forever and would leave holes in the fabric that would be visible later on). I could applique another piece of fabric over top and start again, but that would involve the tree I've already stitched on the left and I really like that tree. Although it's not ideal, I do have a solution (or at least I think I do!) and I will show you that tomorrow. Today your quote is from Scott Adams.... "Creativity is allowing yourself to make mistakes. Art is knowing which ones to keep"
First of all, thank you so much for all the lovely well wishes yesterday. Jack and I had an outstanding steak dinner at a nice restaurant and the waiter brought us a gigantic dessert to share. We waddled out of there quite stuffed but enjoyed every single bite! Two more motifs added using cross stitch and waste canvas (I don't suppose you've noticed that I LOVE that technique!!). The flower on the right was also done using waste canvas. I had the little bees in my stash so they made a perfect addition. Today the quote is from Charles Kingsley..... "We act as though comfort and luxury were the chief requirements of life, when all that we need to make us really happy is something to be enthusiastic about"
I have finished the tree I showed you yesterday - I think. I may add a few more green leaves to it just to help 'lift' it from the background a little more. I also have a cute little owl button I plan to perch in the tree. I removed the waste canvas and then simply added lazy daisy stitches for leaves in various 'fall-ish' colours. I also wrapped the tree trunk with another shade of brown to give it additional interest. Unfortunately the true colours aren't showing in these photos and this next picture is a little blurry. I've had a huge struggle getting these pictures to post to the blog right-size up, so I was happy to get as much as I did! Stem stitch leaves, spider web and buttonhole wheel stitches for the grapes, and couched metallic thread for the curlicues. Pause here for a slight rant - Just had to buy a new cell phone, which in itself is not a bad thing (despite the fact that it's very rarely used and is just over two years old and shouldn't have needed replacing). I buy the absolute cheapest thing I can find because it's just kept for emergencies and the odd very short call. I don't have any desire to surf the web on my phone, and nor do I use it as my primary means of contact. The rant part of this comes from the fact that I stood in the store for over an hour while one (one!!) person waited on several people - two of which she assisted ahead of me because their needs were 'short'. Waa?? Another employee assessed each persons needs and that's the order they were looked after. If I hadn't already been standing there for a very long time by that point I would have walked out. I stuck it out because I imagine the line-up will be the same no matter when I went. One of the 'perks' of living in a small town is that there isn't a whole lot of choice and you're pretty much stuck. There....rant over. Today the quote is from Sister Elizabeth Kenny....."As a girl my temper often got out of bounds. But one day when I became angry at a friend over some trivial matter, my mother said to me, "Elizabeth, anyone who angers you conquers you" I think I should have read those words before I went to the phone store!! I really love working with waste canvas (which I'm sure you have figured out by now!) and this was a great tree to create using that technique. It was 'interesting' getting the threads removed - I think because the stitches were in all different directions. My post tomorrow will show you what I did next with my tree. Today the quote is from Jane Logan..... "When you're stressed is when you most need to look for all the ways that you're blessed"
There is something happening on the creative front at Chez Magpie! I know, it came as a bit of shock to me too. The colours in this photo aren't 'true' but it's all rusty golds and reds (with a tad bit of green) that will ultimately turn into a fall-themed crazy quilt pillow cover. My plan is to make an interchangeable series of pillow covers that I can swap out with the seasons. We'll see if my stick-to-it-ive-ness will end up coming unglued before I complete the entire series!! Further on crazy quilting, Kathy Shaw has opened up registrations for her ICQC102 - Paints/Dyes/Inks/etc. online class (which is still free!). You can go HERE for further information and to register, but you must do so before midnight on Sept. 4th. Came across something rather fun in my travels about about cyber-space today and thought you might find it worth checking out. I must admit a few of these came as a total surprise to me. Go HERE to see what I'm referring to. Today your quote is from Joseph Addison.... "What sunshine is to flowers, smiles are to humanity. They are but trifles, to be sure; but, scattered along life's pathway, the good they do is inconceivable"
I had a grand plan today of taking a photo of the fodder I have pulled from my stash for my next project. Alas, the day has come and gone and now the light is gone and pictures will not be forthcoming. This next project I will be able to share as I go along (don't all fall all over yourselves in relief that the looking back series has drawn to its excruciating demise!!). 1. Wen, of Apple & Apricot, has announced that she is starting a fun new linkie party called 'Simply Neutral Tuesday' and her first party date is next Tuesday (Sept. 8th). If you love neutral shades and want to see what the party is all about, pay her a visit HERE. 2. I know that there's something to be said for not coveting things, but I have to admit that THIS makes my heart go pitter pat. It's something than any knitter would love to have! So handy (pun intended!) and so beautiful, especially the blue one!! 3. 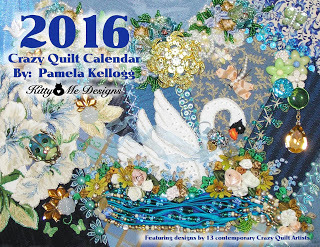 Today is official release day of the 2016 Crazy Quilt calendar by Pam Kellogg of Kitty and Me Designs. It promises to be another amazing showcase of embroidery talent (you can go HERE to see the lineup of artists - pretty cool!!). You can go HERE to order your very own copy (and remember - Christmas is coming and these would make wonderful gifts for all the stitchers in your life). 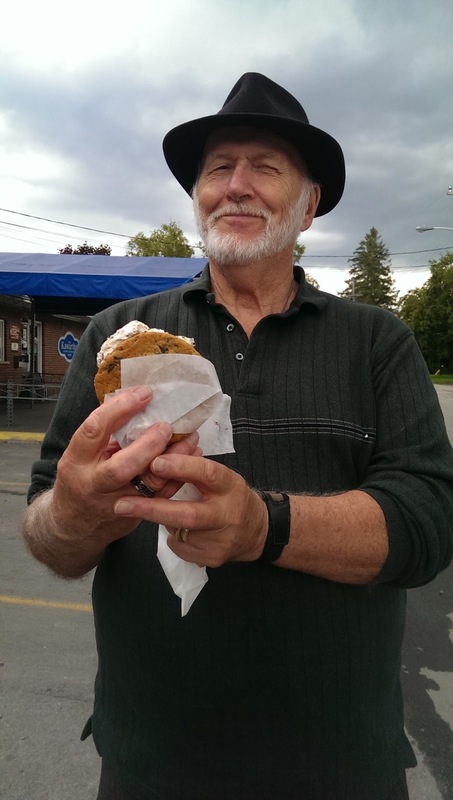 Today your quote is from Bob Talbert...."Teaching kids to count is fine, but teaching them what counts is best"